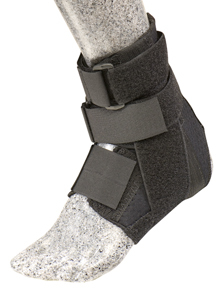 A universal ambidextrous neoprene ankle support that features two simple stirrups which originate from the user's forefoot. Unique ankle system that is comfortable to wear and easy to apply. Helps provide protection and support for lateral and medial ankle instability. Adjustable straps resist inversion and eversion. Designed to allow for both full dorsal and plantar flexion.